Having a dry scalp is not only uncomfortable, but it can also be very embarrassing. Dry skin on the crown of the head can be very prominent and can lead to conditions like dandruff, which are noticeable and often humiliating for the sufferer. Then there’s the pain. A dry scalp can cause irritation across the entire head, and that itching can lead to inflammation, redness, sores and a lot of pain. A dry scalp at the crown can quickly become infected, which could lead to hair thinning or loss, as well as the persistent irritation and soreness. There are many reasons why you might develop a dry scalp. Some people are genetically predisposed to suffer from this condition, while other people are sensitive to temperature or certain hair products. It’s vital for you to figure out what’s causing your dry scalp, so you can focus your energies on finding the right treatment. Let’s take a look at some of the common reasons why you might have a dry scalp at the crown. We’ll also run through some of the most successful treatment options, such as Christina Moss Naturals Shampoo, which can help restore your dry crown to its natural health and stop the persistent itching and irritation in the area. What Can Cause a Dry Scalp On the Crown? It can be hard to determine the root cause. There are many different conditions which could cause dryness – but environmental factors can also play an important part. Understanding what’s causing the dry scalp is instrumental in figuring out how to treat it properly. If you’re working on the assumption that you have a medical condition, when the cause is an allergy or a hair care problem, you can waste a lot of time and money pursuing the wrong treatment options. Eczema – an umbrella term for a number of chronic skin conditions, including atopic dermatitis. 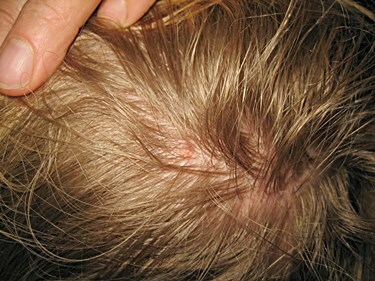 Scalp psoriasis – a condition which causes red, scaly patches on the scalp. Contact dermatitis – usually caused by allergens. Irritant dermatitis – caused by exposure to irritants. Seborrheic dermatitis – a type of eczema that affects sebum-rich areas like the face and scalp. Many of these conditions have quite similar symptoms, which means it can be hard to get a definitive diagnosis straight away. Your dry scalp could also be caused by using shampoo and conditioner with sulfates, or as a result of poor hair hygiene. That’s why it’s advisable to use Christina Moss Naturals Shampoo as it will help and not hinder your recovery. If you’re not sure what’s causing your dry scalp, visit your doctor or a dermatologist. They will be able to carry out an examination and diagnose you properly. Then, when you understand what’s happening to your scalp, you can take steps to treat it. This can be accomplished by using natural, home remedies, or by choosing over-the-counter products. Let’s take a look at some of the options available. There is a multitude of DIY solutions for a dry scalp. Many of them require ingredients you probably have around the house or are able to procure quite easily, even if you’re on a budget. Here are some of the most popular home remedies to treat your dry scalp and restore it to its natural, healthy state. With its antiseptic, antifungal and anti-inflammatory properties, tea tree oil is an all-natural way to help introduce moisture back into your scalp, while fighting off any bad bacteria that may reside at the crown. Undiluted tea tree oil can be quite strong, especially for those who have never used it before. It’s best to dilute it with a carrier oil like olive oil first – or you can add a few drops into your regular shampoo to soothe your itchy, dry scalp and hydrate it fully. Alternative, use a specialist product, such as Paul Mitchell Tea Tree Hair & Scalp Treatment. Coconut oil is renowned for its ability to help lock in moisture all over the body. Many people use it as a regular moisturizer, a hair mask, a makeup remover – its uses are almost endless! Simply take a small scoop of coconut oil, warm it between your hands (until it starts to liquefy) and then massage it gently into your scalp, focusing on the crown. You can leave this hair mask on for an hour, or even overnight. Just make sure to wrap your hair in a towel or a shower cap to prevent getting the oil all over your pillow. Rinse thoroughly and repeat two or three times per week. Here is some info on how to use coconut oil for dry scalp. Another popular home remedy, apple cider vinegar works to balance out the pH levels of the scalp. It also creates an inhospitable environment for fungus and other bacteria, so if you’re suffering from a fungal infection of the scalp that’s causing dryness, this treatment will be ideal. Mix equal parts apple cider vinegar with water, and massage gently onto the scalp. Leave the treatment on for about ten minutes and rinse. Lemon juice works in a similar way to apple cider vinegar, balancing out the pH levels of the scalp and helping to remove dead skin cells. You can mix lemon juice with natural honey for a wonderfully nourishing mask that will leave both your hair and your scalp feeling more hydrated. Mix the juice of a lemon with a few tablespoons of honey and massage into the scalp. It may be quite sticky but keep at it. Rinse with warm water after a few minutes and wash your hair with your regular shampoo. Avocado is naturally creamy, rich and nourishing – all the things your dry scalp needs. It’s packed with vitamins, minerals, and plenty of natural oils, which means it’s great for combatting dryness at the scalp. Mash up one whole avocado and add in some honey and olive oil to create a loose mixture. Massage the mixture directly into your scalp and leave for thirty minutes before rinsing. You can repeat this numerous times per week. Known as one of nature’s own healing elixirs, aloe vera can bring moisture back to your dry crown. Apply some natural aloe vera juice directly to your scalp and leave it in – you don’t need to rinse it away. This magical natural substance can reduce inflammation and dryness all over the scalp. If your dry scalp is quite serious and you’re looking for a dedicated solution formulated in a lab rather than your own kitchen, over-the-treatment options are great. Make sure you follow the instructions when treating your dry scalp, for the best results. Hot oil kits and deep conditioning masks are a great way to add some real moisture to the scalp. You can purchase these at many local pharmacies, as well as in cosmetic or toiletry stores. Many people suffer from a dry scalp because of the formulation of their shampoo. Some don’t even realize their shampoo is the cause! Many popular shampoo brands contain sulfates – artificial ingredients which create that rich, foamy lather. Unfortunately, these ingredients can dry out the scalp completely, which could cause it to become dry and itchy at the crown. Switch to a shampoo that has all-natural ingredients, and see if you notice any difference. Give Paul Mitchell Tea Tree Hair & Scalp Treatment a try! If you suffer from a dry crown, switch to a shampoo that has been designed for dry scalps. You can find many shampoos that have been specially formulated to care for a dry scalp, without stripping away the natural oils that help keep it hydrated on a daily basis. Nizoral anti-dandruff shampoo is also a great option if you want to reduce flaking and moisturize your scalp. There are many options available, and they all contain unique combinations of nutrients designed to prevent the itching and flaking that can accompany a dry scalp. Find Out More in This Nizoral Shampoo Review! If you’re going to use shampoo as the primary way to treat your dry scalp, it might be worth getting a shampoo brush, such as the Rolencos Hair Scalp Brush Shampoo Massager. These gentle brushes are ideal for use in the bath or the shower. They help you to distribute shampoo or oils over your scalp evenly, and many of them provide a fantastic relaxing massage sensation, too. The extra-soft pins will not irritate your already inflamed skin, and you can use the brush to ensure every inch of your scalp is covered with your chosen treatment option. Nobody wants to have a dry scalp, especially at the crown where it’s most noticeable. Having a dry scalp can be painful and irritating, and it can prove an unwelcome distraction at times. If you’re experiencing a severely dry scalp, it’s best to see a dermatologist in order to determine what’s causing the dryness. Getting the right diagnosis is essential when it comes to finding the right treatment. Unfortunately, thousands of people suffer from this problem on a daily basis. But as a bonus, that means there’s a huge community of people trying out new solutions and treatments all the time. If you have a dry scalp at the crown, make sure you treat it before it gets worse, and you’ll soon benefit from a beautifully healthy, moisturized scalp and a thick head of hair once more.